And so the theme (and obsession) continues. Well, we didn’t have a white Christmas in my neck of the woods but we are having quite the blizzard this Boxing Day. Too bad for all those shoppers eager to return gifts and spend those gift cards (in actual concrete and mortar stores, I mean!). The best thing to do on a snowy, winter’s day is to bake (the smart thing to do would be to clean up the mess left from Christmas festivities and exercise to try remove even half of the sweets consumed yesterday, but eh, it’s still the holidays around here and we still have a large quantities of eggs, butter, chocolate chips and MARSHMALLOWS!)! 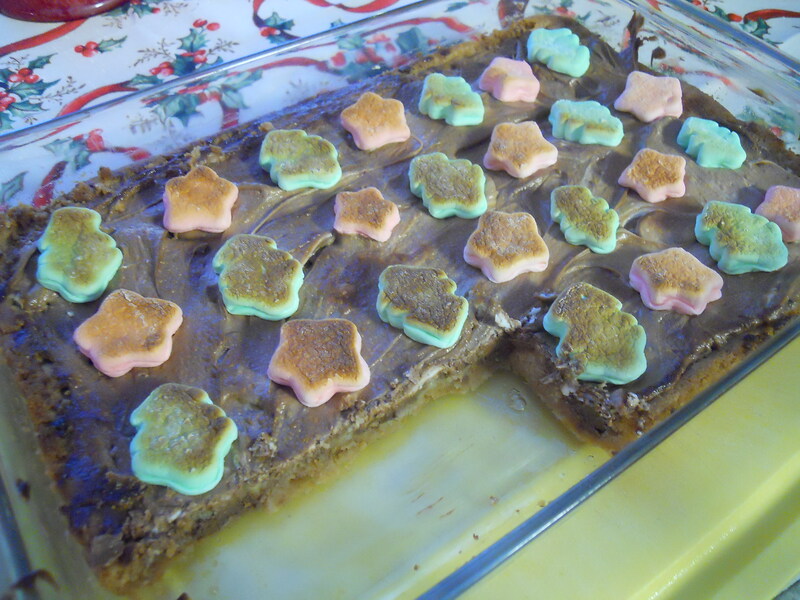 Here’s the wonderful, oh so yummy recipe for s’mores bars with TOASTED MARSHMALLOW (Note: it was a 2006 Grand-Prize Bake-Off winner according to the Betty Crocker website. Extra note: We used holiday marshmallows [see photo above] so as to conserve normal looking marshmallows for our dark chocolate hot cocoa. You can do either one, but our version has a decidedly “Ali” look, doesn’t it?!)! If you’re snowed in today like me, try it! You’ll love it! Bon Appetit!